"Experimenting with forecasts. I think that around 9-11th March Japan will surprise us with an inadequate behaviour. Changes in government are possible, there is a high risk of emergencies and natural disasters of this country.. Forecast made on 4.03.2011, in my LiveJournal (russian) "
A series of earthquakes begun on March 9 at 11:45 (local time, 5:45 MSK), when the first ferocious 7,2-magnitude thrust was registered near the north-east coastline of the main Japanese island Honsu. Japan Meteorological Agency immediately announced tsunami threat. 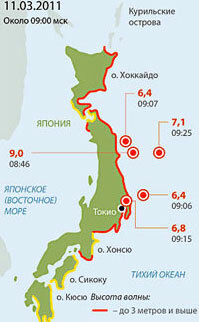 One day later, on March 11 the strongest earthquake in the history of Japan of 9-magnitude hit the country. Detailed description of the disaster can be found in updated Wikipedia materials, at the end of the March already tens of thousands of people are dead and are missing. From astrological point of view, that gives importance to synchronism of events, it is important to note that on March 6, 2011 Japan's prime-minister Naoto Kan accepted sudden resignation of MFA head Seiji Maehara (in connection with financial scandal) that was practically the second most powerful man in the country. The reason for resignation was almost ridiculous – despite local law prohibitions Maehare during last four years has received approximately 200 000 yens (2 400$) from a 72 years old citizen of South Korea. Seiji Maehare was famous because of his hard-edged statements regarding territorial dispute with Russia, statement that “north territories were illegally occupied by Russia” belongs to him. The case is that the new moon point appeared to be a midpoint – middle point between Mercury and Mars. And it clearly stoke the eye as planets were located very symmetrically. I pointed out for myself aggression and proneness to conflict of this combination. Mars is prone to conflicts, and Mercury in Pisces (fall) cannot its best characteristics. Hastily I did not lay stress on the fact that the new moon point at the same time was the midpoint between Uranus and Neptune. When analysing this map after some time, I of course understood that simultaneous combination of several planets that is connected with the new moon point is not simply “an irregularity”, but a serious anomaly that is directly connected with the nature of these planets. Uranus - “suddenness, blast, rebel, revolution, radiation (! ), Neptune - “mystics, water, mental processes, dissolution”. An the importance of the midpoint between Saturn/Uranus=Pluto interpretation of which according to Ebertine Reingold includes “damages from compelling force”?! (2) It is important to highlight that the consequences of tsunami resulted in radiation leakage from damaged Japanese APS that used uranium based fuel. We can see that astrological Uranus and chemical element uranium have strong symbolic bond. Then the astro-cartographic horoscope was build in which I was looking for lines connected with new moon, i.e. with Moon and Sun. Far East region was considerably highlighted. The new moon line on the Ascendant was placed near Japan and taking into consideration the nearness of the Mars line to Japan it looked rather alarming. I will draw your attention to the fact that the astro-cartographic horoscope will be the same for every geographical point, the main requirement is maintain the time. Additionally it is important to take into consideration that planet lines in ACG-horoscope can be calculated with or without the longitude of the planet. The line of the Moon in conjunction with the Ascendant calculated with longitudinal amendments will diverge from line of the Sun with the Ascendant, of course if it is not the case of full sun eclipse. In this new moon the conjunction lines of Moon and Sun with the Ascendant have covered the space that included all main epicentres of March 9-11, 2011 earthquakes. Moreover, the line of the Moon was placed exactly on the shore line that experienced the main strike of the nature – tsunami. Exactly here the consequences of the natural disaster were the most destructive. If you transfer the epicentres of aftershocks of March 11, 2011 onto astro-geographical map then the result will be similar. The place of the 9-magnitude aftershock that have caused the tsunami coincides with the line of Mars on the Ascendant of the new moon horoscope. My suspicions connected with Japan I tested in express mode on the Japanese sovereignty recovery map dated April 28, 1952 (Tokyo, 13:30 GMT) (3). Transits, especially Jupiter passing in opposition to natal Saturn, simultaneous Jupiter entrance into quadrate aspect to Uranus fostered concerns of emergency events. Progressive Moon that usually characterises not the events themselves, but mental condition conjuncted with progressive Pluto and passed through natal Pluto indication intensive period. The date of the events was determined by symbolic direction, note that the distance between Mercury and eclipse point, Mars and eclipse point is approximately 6,5° (4). Add to the new moon horoscope date (March 4 20:45 GMT) approximately 6,5 days and you will get March 10-11, 2011. To make sure I indicated the period of March 9-11 in my forecast. In such cases it is allowed to take the orbis. (1) In ZET program and in other programs – Vega Matrix, Janus, I had slightly different results. But apparently it is caused by embedded mathematical algorithm for horoscope calculation. (2) Moreover, I advise to consider Ebertine Reingold's interpretations only as a starting point, as food for thought and a reason for their inspection. They need to be elaborated and widened. It is not clear why in these interpretations inner planets such as Mars or Venus are viewed as “small servants” according to their influence on human-kind. Why only higher planets have the role rulers of destinies, and inner planets are prescribed only with narrow influence on human interactions? (3) Interpretation of Japan's horoscopes of course deserves a separate work. Unfortunately following next years look critically for this country. (4) I was sure that this direction will work as directions of planets that are located symmetrically regarding the mid-point were tested by me long time ago, they work perfectly also in natal horoscopes. The difficulty does not lie in time itself, but rather in precise description of the event character that is mixed from three planets. (5) During the period 21.03.2010-21.03.2011	zodiac activity schedule was in force where the most powerful sign was Aires. Wars, conflicts, strikes and overall level of conflict correspond to this sign.